A boy called Hero battling to save the planet, a youngster fighting to uncover the truth about his dad, a kitchen boy caught up in black magic and a daring boy time-travelling on the high seas are just some of the stars of a sparkling new selection of children’s books. Can one boy and his batty Dad save the Earth? Gary Haq, a human ecologist who has spent over twenty years supporting the development and implementation of environmental policy in in Africa, Asia and Europe, is on a mission to save our planet and his delightfully inventive debut children’s book is guaranteed to inspire a new generation of eco-warriors. This sparkling, green-coloured adventure – with a big heart and a big message – is brimming with laughter, love and crazy mishaps as a boy called Hero and his dad are forced to reassess their troubled relationship and set out on a joint mission to save Mother Earth from the ravages of climate change. Hero Trough is an ordinary boy who wants nothing more than to have a normal dad. But life was turned upside down when his Mum died and Dad’s only interest became reading books and filling his head with useless facts and figures. Hero describes it as Dad entering ‘Download Knowledge Mode’ and sometimes he would give anything to close his ears and block out Dad’s endless babble. Then one day everything changes when an earthquake, caused by a blistering heatwave, leaves Dad buried and unconscious under a pile of his own encyclopaedias. Gran fears he has been ‘killed by knowledge’ but Dad eventually comes to, claiming to be an Earth Warrior sent to protect the land from a ruthless energy tycoon. The long-suffering Hero is forced to go along with Dad’s new personality but when globetrotting Gran mysteriously disappears, Hero and Dad embark on a dangerous adventure. Can Hero save Gran and get his old dad back before it’s too late? Haq’s work as a researcher at a global environmental think-tank provided the inspiration for this enchanting children’s book which speaks loudly and powerfully about the environment and climate change but still delivers a funny, entertaining and heartwarming adventure perfectly pitched at middle grade readers. Heatwaves, flooding and the need for urgent action are all addressed in the most imaginative and engaging way, and there are emotional messages too about growing up and understanding the sacrifices and compromises which play an important role in family relationships. 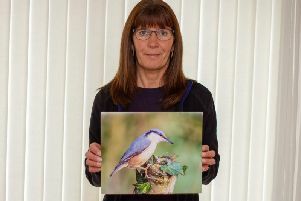 Chorley photographer wins national Wild Bird photography competition with wilko. Every child knows that parents have secrets that they like to keep hidden from their offspring… but sometimes the truth is more harmful when it’s firmly locked away. Adam Baron, who runs the widely respected MA in Creative Writing at Kingston University, London, and is the author of five successful adult novels, has turned his hand to writing children’s books and the result is a moving story that has already been named Waterstones Children’s Book of the Month. With humour and exquisite insight into the human propensity to hide from the emotional assaults of family strife and tragedy, Boy Underwater dives headlong into the troubled life of a youngster struggling to understand his mother’s puzzling behaviour. And it’s a breathtakingly beautiful and carefully controlled journey that will leave young readers gasping for air… whether that’s from tears or laughter. Nine-year-old Cymbeline – so called because his actor dad was playing Shakespeare’s Cymbeline when he met mum – has never been swimming… not ever, not once. His mother won’t let him go near water of any kind so naturally he is a bit nervous at the prospect of his first school swimming lesson. But how hard can it be? He’s Googled front crawl and he has found his dad’s old pair of trunks so he is totally ready for this. What he’s not ready for is the accident at the pool. His false bravado ends in disaster when Cym has to be rescued and loses his swimming trunks in the process. When his emotionally flaky mum discovers what has happened, the incident triggers a chain of events which results in her being admitted to a psychiatric unit and Cym determined to solve a family mystery, including the truth about his dad. Boy Underwater is a wonderful debut, a clever and compelling package that comes with superb illustrations by the talented Benji Davies and brims with emotion but never forgets that it is still essentially a children’s story that aims to entertain as well as educate. Take a pinch of Agatha Christie, a soupçon of Cinderella, and lashings of Harry Potter-style magic and what do you have… a marvellous murder mystery at the creepy Last Chance Hotel. Nicki Thornton, a former independent bookseller and winner of the 2016 Times/Chicken House Children’s Fiction Competition, comes up trumps in this deliciously atmospheric and intriguing debut which melds a classic whodunit with her own special style of magical mystery. The Last Chance Hotel is a clever and compelling story from a fresh and inventive new children’s author who excels at building a rich and exciting world full of bizarre and extraordinary characters, but with the authentic atmosphere of a timeless and classic mystery tale. Seth Seppi is the downtrodden kitchen boy at the remote Last Chance Hotel, owned by the spiteful Bunn family. The ageing, balding head chef Henri Mould is a tartar in the kitchen, the Bunns’ monstrously unpleasant daughter Tiffany torments Seth on an almost daily basis and his only friend is his black cat, Nightshade. But when a strange gathering of magicians arrives for dinner one evening, the kindly, twinkle-eyed VIP guest Dr Thallomius is poisoned by Seth’s special dessert… a dessert whose recipe was cooked up on the orders of the terrible Tiffany. A locked-room murder investigation quickly follows… and Seth, of course, is the prime suspect. But the funny thing is Seth is actually innocent… can he solve the mystery and clear his name, especially when dark magic is afoot? This gloriously tangled web of magic, mayhem, murder and mystery is a tasty dish for young readers who like to indulge in their own detective work, and a thrilling read for daring adventurers unafraid to step inside an amazing world of danger and deception. Open up a ‘hole’ new world for inquisitive children in the pages of this big, bold and exciting new book from ever-inventive publishers 360 Degrees. A non-fiction imprint of the Little Tiger Group, 360 Degrees offers a stimulating and creative approach to presenting facts and Holes, an accessible and unique look under the surface of the world, certainly leaves no stone unturned on its fact-finding mission. Children will love discovering just what makes a hole a hole, and how they shape our world, in this super-sized book which explores an amazing world of burrows and boreholes, subways and sinkholes. From the mythical and mysterious to household and human holes, find out what makes a hole a hole and how they shape our world. Split into five main sections that make it easy to navigate, this extraordinary book takes us on a journey that encompasses science and nature as well as the human experience, burrowing into philosophy, myth, the arts, religion, sport, music and architecture… all through the medium of holes! Written by Jonathan Litton who loves using his science background to explore sea creatures, space and saving the planet, and illustrated by Thomas Hegbrook, a nature lover with a talent for art and design, Holes is a visual spectacle as well as a compelling learning tool. By diving deep into a topic that is sure to capture childhood imaginations, this refreshingly different book – packed with stunning illustrations and accessible facts – allows youngsters to think beyond the parameters of the world’s surface and make exciting new discoveries. Master storyteller Philip Pullman’s unforgettable time-travelling adventure on the high seas gets a spectacular makeover in this thrilling and inventive comic-strip style book. Originally seen in The Phoenix comic, Pullman’s superb seafaring novel, The Adventures of John Blake: Mystery of the Ghost Ship, is a visual feast combining high-octane action and a deep twisting, turning mystery which explores the exciting concept of time travel. Here, the adventure is brought to vivid and graphic life through the artwork of Fred Fordham who began to understand the power of comics and graphic novels while he was at university and gave himself a crash course before releasing his debut graphic novel series, Nightfall. In Mystery of the Ghost Ship, we meet John Blake and his mysterious ship, the Mary Alice. Blake and his crew are trapped in the mists of time by a terrible research experiment gone wrong and are doomed to sail the endless waters and between the centuries – from Ancient Rome to the 20th century – as they search for a way home. In the ocean of the modern day, John rescues Serena, a shipwrecked girl of his own age, and promises to help. Serena had been with her father on a mission to save the world but, when their ship was caught up in a storm, she was swept overboard. Pullman blends science fiction, mystery and adventure in a fabulous tale of ocean wave fantasy while Fordham’s superbly energetic artwork brings the atmospheric and danger-packed story to vivid and graphic life, creating a cinematic treat for young time-travel fans. Get your claws into Guy Bass’s new supercharged Spynosaur adventure and enjoy action, excitement, tanks, wigs, eggs… and dinosaurs on horseback! The award-winning author is back with his trademark humour, action, high-octane energy and geeky technology for the hilarious new book in his superhero, super funny Spynosaur action series. Featuring comic-strip pages and doodles from Kung Fu Panda artist Lee Robinson, Spynosaur is the world’s first spy dinosaur, on a mission to make crime extinct and save the day with a swish of his mighty tail. Spynosaur is secret agency Department 6’s not-so secret weapon. Created by mysterious science rays, Spynosaur, the first ever Super Secret Agent Dinosaur, has the mind of a super spy and the body of a dinosaur. Together with his daughter Amber, this prehistoric hero protects the world from villainy. When Spynosaur is accused of eating the princess of Canada’s prized pet, Pugsy Malone, he has his Right to Spy revoked! Facing imprisonment in Department 6’s inescapable prison, The Bin, Spynosaur goes rogue. Together with his sidekick Amber, Spynosaur is pursued across the globe by his former fellow agents, including Danger Monkey, Dr Newfangle, and expert tracker Jet Setter. But without his gadgets and equipment, and with the full force of Department 6 bearing down on him, can our hero clear his name? Anarchic humour and action-packed, technology-filled missions meet in glorious madcap madness as the world’s only prehistoric powerhouse dishes out justice and juicy jokes to a host of eccentric enemies. A master of comedy, Bass knows how to touch the funny bone of his young readers and this zany story, packed with puns, comic-style illustrations and cultural references appeals to both kids and their parents. Another fun-filled outing with the daring dinosaur spy! Much-loved author Holly Webb is back to bewitch and beguile her young readers with the new cute and cuddly adventure in her adorable Animal Stories series which has sold 650,000 copies since the first story hit the shelves in 2006. Webb has written over 90 books for children and the Animal Stories continue to gain momentum with the release of the Animal Stories app in 2015 and the launch of a fan club on the Animal Stories website. In this gorgeous new adventure, we meet Kaitlyn who visits her local animal shelter as part of her school’s community week and falls in love with Teddy, a gorgeous whippet cross puppy, who becomes the star of her project. But when a boy in her class watches Kaitlyn’s presentation and decides he wants to adopt Teddy, she realises how much she wants to keep Teddy herself. Sophy Williams provides the gorgeous black and white illustrations for this enchanting and gentle series which has captured the hearts of every animal-loving child. And don’t forget to look out for the free app on App Store and Google Play. It’s jam-packed with exciting activities from fantastic games and puzzles to creative colouring and sticker fun. Perfect for children just starting to read alone, youngsters who love to share a book with mum and dad, and any child who can’t resist the allure of animals. If you thought the Gruffalo was scary, take a look at these beastly beasts! Julia Donaldson and Axel Scheffler, one of the world’s top picture book teams, have been busy creating the Ugly Five, the African animals with a reputation for being a little grisly and grotesque. It was while she was on safari during a South African book tour that Donaldson was introduced to the much-admired ‘Big Five’ animals… the lion, leopard, elephant, rhino and buffalo. But the author extraordinaire was much more intrigued by the ‘Ugly Five’ and has now made them the stars of her wonderful new picture book. So meet wildebeest and warthog, lappet-faced vulture, spotted hyena and marabou stork. Some people might call them ugly but this line-up of strange-looking beasts are set to become the latest classic characters in the world of picture books. And they are also helping to raise money for Tusk, a pioneering charity that supports the people and wildlife of Africa with projects that aim to alleviate poverty, improve education and reduce conflict. Who’s that singing on the savannah? It’s the top five ugly animals in Africa! The wildebeest, warthog, vulture, hyena and marabou stork are gangly, warty, bumpy, bristly, spotty and stinky but they proudly amble across the savannah, rejoicing in their ugliness. Fortunately, not everyone thinks they are ugly. Peeping from burrows and inside the trees are their babies who think their cuddly, brave and strong parents are the most beautiful creatures alive! Scheffler’s distinctive, bold and gloriously quirky illustrations bring the savannah to colourful, comical life and are the perfect foil for Donaldson’s funny and heartwarming story which is brimming with her addictive, rhythmic verse and such fun to read aloud to children. A joyful celebration of unloved animals and another comic masterpiece from a superstar duo! Here’s a cracking story for all little ones who love dinosaurs! South African picture book writer and illustrator Alex Latimer gets into the rhythm of a baby dinosaur’s blues as it desperately tries to track down its lost parents before night falls. ‘Excuse me, please, but am I yours? I’m sure I am a dinosaur’s!’ When an icy wind pushes an egg from its nest, five friendly dinosaurs must get it home before dark. But who does the lost egg belong to? And will they work out who his parents are in time to save the baby dinosaur inside? Latimer’s bold and colourful artwork is the perfect foil for a gentle, rhyming story which introduces young readers to a host of fascinating dinosaur species from the spiky Stegosaurus and the long-necked Brachiosaurus to the three-horned Triceratops.